Alex Johnson Included In Album Featuring Julian Lennon, Dan Ackroyd, Alan White, Janis Ian and More! 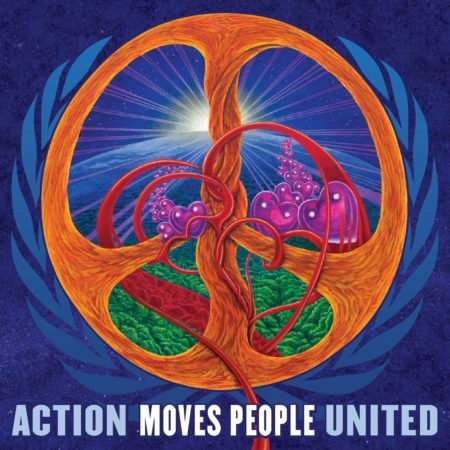 I am delighted to announce that a track that I composed music for and provided spoken word was included in the new album by Action Moves People United (AMPU) which was released on Sep 21 (World Peace Day). The selection entitled “A Dream Of Peace” features words by Prof Ed McCarthy and Renee Ruwe. The guitar accompaniment and spoken word was recorded by Brian Sargent at Aberrant Sound in Wrentham, MA this past spring (with piano/keyboards added by Paul Martuano). It was edited and mixed by Rupam Sarmah. I’m really proud to have been asked to be part of this project and encourage you to check out more of what AMPU does. See and like the AMPU Facebook page here and read more about the project below. OVER 300 INTERNATIONAL ARTISTS CONTRIBUTE from over 30 countries featuring Dan Aykroyd, Julian Lennon, Kathy Sledge, Alan White, Geoff Downes, John Wetton, Patrick Moraz, Annie Haslam, Janis Ian, Martin Barre, Colin Andrews, Lillias White, and many other artists! Action Moves People United, a World Peace Project with UNESCO – U.S. Federation of UNESCO Clubs & Associations, is produced by Grammy® Winner Kevin Mackie, award winning producer Krista Wallhagen, and Guinness World Record® holder musician and award winning filmmaker Rupam Sarmah. Through media initiatives, in collaboration with artists, authors, and organizations from all around the world, AMPU’s mission of establishing a peaceful planet and a healthy biosphere will be an ongoing commitment. One of the goals for the project is to pair up artists who live in opposing countries for collaborations that go beyond politics, religion and borders. The team has produced a musical spoken word album that will exchange ideas, stories, and information focused on bringing about World Peace through individual responsibility, Education, and helping each other. The goal of the project is to raise awareness of environmental and humanitarian crisis and find actionable solutions. UNESCO (United Nations Educational, Scientific and Cultural Organization) strives to promote peace and security among nations through education, science, and culture. “I pray for the moment of mass consciousness when we all wake up and bring peace into our own hearts and souls. It’s a challenge and it’s going to take every one of us to make it happen,” says Dan Aykroyd. Five (mostly) Free Shows In Two Weekends To Close Out Summer And Welcome Fall! Well, you can tell from the orange backed logo header that the fall must be upon us. It’s “crisp” in the mornings now. Which is another way of saying it’s time to swap out the flip flops for wool slippers when picking up the morning paper from the driveway. Sad to see but an eventuality here where we live. But we’re not going to let the mercury in the thermometer tell us it’s not time to keep making the rock and roll. No, siree. We have two big weekends of shows to close out September and welcome the official end of summer. Firstly I’d like to thank Sheryl Hunter from the Greenfield Recorder for publishing a great piece on the evolution of the band in the run up to our show at The Root Cellar a couple of weeks ago. It helped bring in some folks to see us and a great band from Philly, Flux Capacitor. Go see them if you get a chance. You can read a great review of the show here which includes audio and video of our new song, “Love Is All Around You” as well. Transperformance was a blast as usual. Thanks to the Northampton Arts Councilfor having us take part again. It was so much fun taking on Foo Fighters for fifteen minutes. Click on the links to see our take on “Times Like These” (filmed by Dann Vasquez) and “Everlong” (filmed by Maria Bull) if you like. But there are still big shows to come. Tonight, 9/16 we will be playing at La Boca in Middletown, CT, which is home to Wesleyan University and not far from Hartford at all. This will be our first appearance there so if anyone has friends in the area please share this email with them. We’d love to pack that room. The show is free and runs from 10pm-1am. Tomorrow, 9/17 we will be at The Basement in downtown Northampton, MA. We’ll have a great band from Boston opening the show, Try. Check out their Facebook page here and watch/listen to their song, “Barcelona” right here. We’re excited to have them on the bill. Come out early and give them a warm Northampton welcome if you can. They start at 8pm and we go on at 9pm. The show is absolutely free (though tips are appreciated). Next weekend we have three shows planned. Friday, 9/23 we will be making a stop at The Skinny Pancake in Hanover, NH. We played their Burlington, VT location a while back and it was a great time. Come on out and celebrate the opening of their newest spot. This show is also absolutely free and all ages. We’ll start at 8:30 and play two sets! Saturday, 9/24 we head to Orange, MA to be part of the “Festival That Stinks.” That’s right, the North Quabbin Garlic and Arts Fest has us on their music schedule and we couldn’t be more thrilled if you gave us a garlic hot fudge sundae (available, I believe, at the festival). We will play at 2:15 and we are happy to say that Shokazoba (featuring Colorway’s own Matt and Riley on bass and drums) play at 3:30. Should be a great time. The festival is $5 for adults and kids 12 and under are free. The fest runs both Sat and Sunday and they have a weekend pass for $8. Finally, on Sunday, 9/25, weather permitting, we will be gracing the deck of one of Brattleboro, VT’s best place for food, drinks and music, Whetstone Station. With a breathtaking view of the Connecticut River this should be one of Colorway’s most scenic gigs ever! The show runs 5-8pm, is completely free and is all ages. Just a note: as described, if there is rain forecast the show will be cancelled and rescheduled. Please check our website for any changes. Well, that’s it for a while. We have a big gig in October opening up for Television’s Richard Lloyd on 10/6 but I’ll send out another email after these five gigs roll on out. Thanks very much for reading this far, for believing in the power of music, for supporting independent artists and for rocking in the free world. And if you can’t make it to any of these shows but have some friends that would we would be ever so grateful if you forwarded this on to them. Come on out to see us play at this very cool venue right near the Wesleyan campus (20 mins from Hartford). Amazing food and drinks. We’ll play all night for ya. Dinner menu and full bar for your enjoyment. We are excited to be bringing a great band from Boston, Try, to open this show. Try is–in their own words–“a hybrid of rock and electronica” and we’re hoping to get a good early crowd out to see their first Northampton appearance. Check them out on Facebook here. The Basement has a full bar for your enjoyment. More info and full Basement schedule here. Virtuoso slide guitarist Niles Elliott and songwriter Dylan Edmunds met and began collaborating during their freshman year of college (2013-14) at Berklee College of Music. A year later, Dylan’s brother, Conner, arrived at Berklee and joined the collaboration. The three of them began writing and rehearsing in search of a sound they could call their own. With specialties in sound design, midi programming, and pop production, TRY’s style is maturing into a hybrid of Rock and Electronica. Come check out two full sets of music at Hanover, New Hampshire’s newest place for live entertainment. Saturday, September, 24, Colorway Performs at The North Quabbin Garlic and Arts Festival! Really excited to be part of this special festival celebrating one of the most intoxicating foods ever: garlic! Two full days of food, music and art at the North Quabbin Garlic and Arts Festival. Colorway plays 2:15-3:15 and immediately following our set stay put for local afro beat legends, Shokazoba, featuring Riley and Matt on drums and bass. Not to be missed! Weather permitting*, Colorway will be performing two full sets on the deck of Brattleboro’s best restaurant, Whetstone Station. The venue is located right off of downtown and right on the banks of the Connecticut River. Don’t miss this very special performance. Whetstone Station has amazing food, craft beers, a full bar and so much more. *Note: in case of inclement weather show will be cancelled and rescheduled. Many thanks to Sheryl Hunter at the Greenfield Recorder for the great piece and for always being so supportive of what we do.